Select this package for three 6' long by 2.5' wide table and 18 white poly chairs. 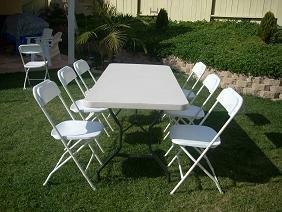 You can also order more chairs separately under concessions and add-ons. Due to being used outdoors, they may have some staining, so please don't expect them to be perfect. Rental does not include setup of tables and chairs.